초광각 광학계를 제공한다. It provides an ultra-wide-angle optical system. 본 발명은 물체측으로부터 차례대로 적어도 하나의 비회전대칭 렌즈면을 구비하고, 전체적으로 부의 굴절력을 갖는 제1렌즈군 ; The present invention having at least one non-rotationally symmetrical lens surface in turn from the object side, a first lens group having a negative refractive power as a whole; 불필요한 광을 제거하는 개구 조리개 ; An aperture stop for removing unnecessary light; 및 적어도 하나의 비회전대칭 렌즈면을 구비하고, 전체적으로 정의 굴절력을 갖는 제2렌즈 ; And at least one non-rotating second lens having a positive refractive power, and a whole having a symmetrical lens surface; 을 포함한다. It includes. 본 발명에 의하면 6매의 렌즈만을 이용하여 수평화각 180도이상을 구현함과 동시에 수직화각은 수평화각에 대하여 1/2정도가 되도록 제한하여 불필요한 수직영역의 영상을 제한할 수 있으며, 렌즈의 구성매수가 적고 첫번째 렌즈의 구경을 작게 하여 컴팩트하고 전장이 극히 작은 초소형 광학계를 구현할 수 있는 한편, 제작이 용이하여 대량생산이 가능하고, 제조비가 적게 소요되는 광학계를 구현할 수 있다. According to the present invention by using only the six lenses and at the same time implementing a horizontal angle of view of 180 degrees and a vertical view angle is limited such that one-half degree relative to the horizontal angle of view, and can limit the unnecessary image of the vertical area, the configuration of the lens the small number of smaller diameter of the first lens to a compact, full-length that can be implemented with an extremely small compact optical systems while manufacturing is easy and mass production is possible, and can implement an optical system which requires less manufacturing cost. 본 발명은 초광각 광학계에 관한 것으로 보다 상세히는 특정방향에 대하여 보다 넓은 화각을 가지면서 소형화를 도모하고 제조비용이 저렴한 초광각 광학계에 관한 것이다. The present invention relates to an ultra-wide-angle optical system in more detail, to a miniaturized while having a wider angle of view with respect to a particular direction, and the manufacturing cost low ultra-wide-angle optical system. 일반적으로 차량용 카메라 또는 감시용 카메라에 채용되는 광학계는 전방,측방 및 후방등의 영상을 보다 넓은 범위를 촬영하기 위하여 수평화각이 일정각도이상의 넓은 화각을 갖는 광각렌즈를 요구함과 동시에 광학계에 채용되는 렌즈의 소형 및 경량화가 요구되고 있다. An optical system which is generally employed in a camera for a vehicle camera or a monitoring lens employed in the horizontal angle of view this requires a wide angle lens having a wide viewing angle than a predetermined angle and at the same time, the optical system in order to shoot a wider range of the image, such as front, side and rear the small-sized and lightweight has been required. 특히, 차량용 카메라에 채용되는 광학계는 수직방향에 대해서는 지면으로부터 수평선까지 대략 90도의 화각을 갖추는 반면에 수평방향에 대해서는 충분한 시야를 확보하기 위하여 수직방향의 화각보다는 상대적으로 넓은 화각을 갖도록 설계되어야 한다. In particular, the optical system employed in the vehicle camera should be relatively so as to have a wide viewing angle design than the vertical angle of view to the other hand, for the vertically align the field of view approximately 90 degrees from the surface to the horizontal to ensure a sufficient field of view for the horizontal direction. 일반적인 광학계를 구성하는 렌즈는, 광축에 대하여 회전대칭적인 원형이고, 이러한 광학계에서 받아들여지는 빛도 원형이기 때문에, 회전대칭적인 광각렌즈를 채용한 광학계를 카메라에 탑재하게 되면, 불필요한 영역의 화상이 많이 비추 어지는 것과 동시에 이미지센서의 상면에도 불필요한 이미지 영역이 발생하게 된다. Since lenses of a common optical system is a rotationally symmetrical circular with respect to the optical axis, receiving in this optical system Accepted the light is also a circle, when to mount the optical system employing a rotation symmetrical wide-angle lens in the camera, the unnecessary area image the upper surface of the image sensor at the same time, even as much eojineun illuminated is unnecessary image area occurs. 또한, 넓은 화각을 갖는 광학계를 회전대칭렌즈로 구성하는 경우, 광학계의 광축방향 길이가 길어지고, 주변광량을 확보하기 위해서 렌즈지름을 크게 해야만 하기 때문에, 광학계의 콤팩트화를 저해하는 요인으로 작용하였다. In addition, when configuring an optical system having a wide angle of view in a rotationally symmetrical lens, it is an optical axis direction length of the optical system longer, to have a lens diameter larger in order to secure the peripheral light amount due, and acts as a factor for inhibiting the compactness of the optical system . 따라서, 본 발명은 상기와 같은 문제점을 해결하기 위한 것으로, 그 목적은 소형화 를 도모하고, 제조비용을 절감함과 동시에 수직방향 화각에 비하여 수직방향의 화각을 보다 넓게 확보할 수 있는 초광각 광학계를 제공하고자 한다. Accordingly, the invention is intended to solve the above problems, and its object is provide an ultra-wide-angle optical system can be made smaller, more widely secure the field of view in the vertical direction as compared with at the same time as reducing manufacturing costs vertical angle of view it would. 상기의 목적을 달성하기 위한 일 측면으로서 본 발명은, 물체측으로부터 차례대로 적어도 하나의 비회전대칭 렌즈면을 구비하고, 전체적으로 부의 굴절력을 갖는 제1렌즈군 ; The present invention as an aspect for achieving the above object is provided with at least one non-rotationally symmetrical lens surface in turn from the object side, a first lens group having a negative refractive power as a whole; 불필요한 광을 제거하는 개구 조리개 ; An aperture stop for removing unnecessary light; 및 적어도 하나의 비회전대칭 렌즈면을 구비하고, 전체적으로 정의 굴절력을 갖는 제2렌즈 ; And at least one non-rotating second lens having a positive refractive power, and a whole having a symmetrical lens surface; 을 포함하는 초광각 광학계를 제공한다. It provides an ultra-wide-angle optical system comprising a. 바람직하게, 상기 제1렌즈군은 물체측 면이 물체측으로 볼록하고, 상측면이 상측으로 오목한 형상을 갖추어 부의 굴절력을 갖는 제1렌즈와, 물체측 면과 상측 면이 비회전대칭렌즈면으로 구비되고 부의 굴절력을 갖는 제2렌즈및 물체측 면이 물체측으로 볼록한 형상을 갖추어 정의 굴절력을 갖는 제3렌즈를 포함하고, 상기 제2렌즈군은 물체측 면이 물체측으로 볼록하고 상측 면이 상측으로 볼록한 형상을 갖추어 정의 굴절력을 갖는 제4렌즈와, 물체측 면이 상측으로 오목하고 상측 면이 물체측으로 오목한 형상을 갖추어 부의 굴절력을 갖는 제5렌즈 및 물체측 면과 상측 면이 비회전대칭렌즈면으로 구비되어 정의 굴절력을 갖는 제6렌즈를 포함한다. Preferably, the first lens group is an object side surface convex toward the object, comprising a first lens, the object side surface and a symmetrical lens surface on the image-side surface is non-rotating the image-side surface having a negative refractive power and equipped with a concave shape toward the image side and parts of a third lens having a second lens, and the object-side surface defining equipped with a convex shape toward the object, the refractive power having a positive refractive power, said second lens group is an object side surface convex toward the object and the image side surface faces the image side convex and the fourth lens equipped with the image having a positive refractive power, the object side surface is the fifth lens and the object side surface and the surface is a non-rotating upper mirror lens side with the side recess in the upper side and the upper side having a negative refractive power and equipped with a concave shape toward the object side is includes a sixth lens having a positive refractive power provided. 더욱 바람직하게, 상기 제1,2렌즈군의 렌즈들중 적어도 2개이상이 렌즈가 적 어도 한면이 비구면인 플라스틱 소재로 이루어진다. More preferably, the first and second lens group comprises a lens of plastic material, at least one surface is an aspherical lens is less even if two or more of. 더욱 바람직하게, 상기 제1렌즈군과 제2렌즈군은 상면에서의 장축화각이 130도이상으로 구비된다. More preferably, the first lens group and the second lens unit is the major axis angle of the upper surface is provided with 130 degrees or more. 더욱 바람직하게, 다음의 조건식 1을 만족한다. More preferably, it satisfies the following conditional expression 1 below. 여기서, FOVX : 장축화각이고, FOVY : 단축화각 이다. Here, FOVX: a major axis angle, FOVY: a speed-field angle. 더욱 바람직하게, 다음의 조건식 2를 만족한다. More preferably, it satisfies the following conditional expression 2. 여기서, EFY : 단축 유효초점거리이고, EFX : 장축 유효초점거리이다. Here, EFY: a shorter effective focal length, EFX: the major axis is the effective focal length. 더욱 바람직하게, 다음의 조건식 3을 만족한다. More preferably, it satisfies the following conditional expression 3 below. 여기서, r1 : 제1렌즈의 물체측 면의 곡률반경이다. Where, r1: a radius of curvature of the object side surface of the first lens. 더욱 바람직하게, 다음의 조건식 4을 만족한다. More preferably, it satisfies the following conditional formula 4. 여기서, L : 제1렌즈의 물체측 면의 정점에서 상면까지의 거리이고, 2w : 장축화각(radian)이다. Where, L: distance and, 2w at the apex of the object side surface of the first lens to the top: a long axis angle (radian). 더욱 바람직하게, 다음의 조건식 5을 만족한다. More preferably, it satisfies the following conditional expression 5. 여기서, Fno : 광학계의 F-넘버이다. Here, Fno: an F- number of the optical system. 상기한 구성을 갖는 본 발명에 의하면, 6매의 렌즈만을 이용하여 수평화각 180도이상을 구현함과 동시에 수직화각은 수평화각에 대하여 1/2정도가 되도록 제한하여 불필요한 수직영역의 영상을 제한할 수 있다. According to the present invention having the above structure, by using only the six lenses and at the same time implementing a horizontal angle of view of 180 degrees and a vertical view angle is limited such that one-half degree relative to the horizontal angle of view to limiting the image area of ​​the unnecessary vertical can. 또한, 렌즈의 구성매수가 적고 첫번째 렌즈의 구경을 작게 하여 컴팩트하고 전장이 극히 작은 초소형 광학계를 구현할 수 있는 한편, 제작이 용이하여 대량생산이 가능하고, 제조비가 적게 소요되는 광학계를 구현할 수 있다는 유리한 효과가 있다. Further, advantageous that the smaller the aperture of the first lens less configuration number of the lens to a compact, full-length this can be implemented with an extremely small compact optical systems while manufacturing is easy and the mass production is possible, to implement an optical system which is less manufacturing cost required there is an effect. 이하, 본 발명의 실시예에 대하여 첨부된 도면에 따라서 보다 상세히 설명한다. It will now be described in more detail according to the accompanying drawings, with respect to the embodiment of the present invention. 도 1은 본 발명에 의한 초광각 광학계를 도시한 렌즈 구성도로서, (a)는 렌즈면의 정점을 원점이라 하고 광축방향을 Z축으로 하는 3차 기초 좌표계(X,Y,Z)에서 Z축을 통과하는 XZ평면에서 종단한 종단면도이고, (b)는 3차 기초 좌표계에서 Z축을 통과하는 YZ평면에서 종단한 종단면도이다. 1 is a block diagram lens construction showing an ultra-wide-angle optical system according to the present invention, (a) is Z in the third base coordinate system (X, Y, Z) to the optical axis direction is referred to as a home position for the vertex of the lens surface in the Z-axis axis It is a longitudinal sectional view in the XZ plane through termination, (b) is a longitudinal sectional view of a profile in the YZ plane through the Z-axis in the third coordinate system based. 이하, 렌즈구성도에서 렌즈의 두께, 크기 형상은 설명을 위해 다소 과장되게 도시되었으며, 특히 렌즈구성도에서 제시된 구면 또는 비구면의 형상은 일체로 제시되었을 뿐 이 형상에 한정되지 않는다. The thickness, size, shape under a lens in the lens configuration diagram was shown to be slightly exaggerated for purposes of illustration, in particular the shape of a spherical or aspherical surface shown in the lens configuration diagram is not the only has presented integrally limited to the shape. 도 1에 도시한 바와 같이, 본 발명의 제1실시예에 따른 초광각 광학계는 물체측으로부터 차례대로 제1렌즈군(LG1), 조리개(S) 및 제2렌즈군(LG2)을 포함한다. 1, the ultra-wide-angle optical system according to the first embodiment of the present invention includes a first lens group (LG1), the aperture (S) and the second lens group (LG2), in turn from the object side. 상기 제1렌즈군(LG1)은 전체적으로 부의 굴절력을 가지며, 하나의 비회전대 칭 렌즈면을 구비하며, 이러한 제1렌즈군(LG1)은 제1,2 및 3렌즈(L1,L2,L3)를 포함한다. The first lens group (LG1) has a negative refractive power as a whole, provided with a side one non rotating platform called a lens, this first lens group (LG1) is a first and second and third lenses (L1, L2, L3) of It includes. 상기 제1렌즈(L1)는 부의 굴절력을 가지며 물체측 면(1)이 물체측으로 볼록하고, 상측 면(2)이 상측으로 오목한 형상을 갖는 렌즈요소이며, 상기 제2렌는(L2)는 부의 굴절력을 가지며, 물체측 면(3)과 상측 면(4)이 모두 비회전대칭렌즈면으로 구비되는 렌즈요소이며, 상기 제3렌즈(L3)는 정의 굴절력을 가지며 물체측 면(5)이 물체측으로 볼록한 형상을 갖는 렌즈요소이다. The first lens (L1) is a lens element having a concave shape to the image side convex, and the image-side surface (2) having a negative refractive power object-side surface (1) toward the object, the second renneun (L2) has negative refractive power to have, the object-side surface (3) and the upper surface 4 are both a lens element which is provided with a non-rotationally symmetrical lens surface, the third lens (L3) having a positive refractive power and the object-side surface (5) toward the object a lens element having a convex shape. 상기 제2렌즈군(LG2)은 전체적으로 정의 굴절력을 가지며 적어도 하나의 비회전대칭 렌즈면을 구비하며, 이러한 제2렌즈군(LG2)은 제4,5, 및 6렌즈(L4,L5,L6)을 포함한다. The second lens group (LG2) having a positive refractive power as a whole and is provided with at least one non-rotationally symmetrical lens surface, this second lens group (LG2) is the 4,5, and 6, the lens (L4, L5, L6) It includes. 상기 제4렌즈(L4)는 정의 굴절력을 가지며 물체측 면(8)이 물체측으로 볼록하고 상측 면(9)이 상측으로 볼록한 형상을 갖는 렌즈요소이며, 제5렌즈(L5)는 부의 굴절력을 가지며 물체측 면(10)이 상측으로 오목하고 상측 면(11)이 물체측으로 오목한 형상을 갖추며, 양측 렌즈면(10,11)이 비구면으로 이루어지는 렌즈요소이며, 제6렌즈(L6)는 정의 굴절력을 가지며 물체측 면(12)과 상측 면(13)이 비회전대칭 렌즈면으로 구비되는 렌즈요소이다. The fourth lens (L4) having a positive refractive power and the object-side surface (8) is convex toward the object side and a lens element having an upper surface (9) convex to the image side, a fifth lens (L5) having a negative refractive power the object-side surface 10 is gatchumyeo a concave shape recessed toward the image side and the image-side surface (11) toward the object side, a lens element either side lens surface (10, 11) is formed into an aspheric surface, the sixth lens (L6) has a positive refractive power having the object-side surface 12 and the upper surface 13 is the lens element which is provided with a non-rotationally symmetric lens surface. 상기 제1렌즈군(LG1)과 제2렌즈군(LG2)사이에는 불필요한 광을 제거하기 위한 개구 조리개(S)를 배치한다. There is disposed an aperture stop (S) for removing unnecessary light between the first lens group (LG1) and the second lens group (LG2). 상기 제2렌즈군(LG2)의 뒤쪽에는 적외선 필터, 커버 글래스 등으로 이루어진 광학적 필터(Optical Filter, OF)가 구비되며, 상기 적외선 필터와 커버 글래스는 필요에 따라 다른 필터 등으로 대체하거나 생략할 수 있으며, 본 발명의 광학적 특성에는 원칙적으로 영향을 미치지 않는 것으로 한다. The second rear lens group (LG2) there is provided an optical filter (Optical Filter, OF) consisting of an infrared filter, a cover glass or the like, the infrared filter and a cover glass, which may be replaced or omitted, a different filter, as needed and, it is assumed that does not in principle affect the optical properties of the present invention. 또한, 이미지 센서는 고체촬상소자(Charged Coupled Device; CCD) 및 보상금속반도체(Complementarly Metal Oxide Semiconduct; CMOS) 등으로 이루어지며, 렌즈가 형성하는 상을 수광하는 상면(감광면)(IP)에 대응하여 광학적 필터(OF)의 뒤쪽에 배치된다. In addition, the image sensor is a solid-state image sensor corresponding to the top surface (photosensitive surface) (IP), which is made as such;; (CMOS Complementarly Metal Oxide Semiconduct), receives the phase that the lens is formed (Charged Coupled Device CCD) and compensation metalsemiconductor and it is disposed at the back of the optical filter (oF). 본 발명의 제1실시예 내지 제3실시예에서는 물체측 면(3,12)과 상측 면(4,13)이 비회전 대칭 렌즈면으로 이루어지는 제2렌즈(L2)와 제6렌즈(L6)가 플라스틱과 같은 수지재로 이루어지며, 상기 제5렌즈(L5)의 물체측 면(10)과 상측 면(11)이 모두 비구면으로 이루어져 있으나 이에 한정되는 것은 아니다. The first embodiment to the third embodiment, the object-side surface (3,12) and the upper side (4,13) of the second lens (L2) and a sixth lens (L6) formed of a non-rotationally symmetrical lens surface of the present invention made of a resin material such as a plastic, and the fifth, but both the object side surface 10 and upper surface 11 of the lens (L5) is made up of an aspherical surface is not limited thereto. 제1렌즈(L1)는 부의 광학적 파워를 갖추어 광을 크게 굴절시키는 기능을 가지며, 제2렌즈(L2)는 제1렌즈(L2)에서 굴절시킨 광을 더욱 부의 광학적 파워로 굴절시킴과 동시에 상면(IP)에 이르는 광의 X축방향(장축)의 길이와 Y축방향(단축)의 길이간의 비율을 장축방향의 화각이 넓어지도록 변화시킨다. The first lens (L1) is a portion having a function of equipped optical power significantly refract the light, a second lens (L2) has a first lens (L2), the upper surface of the refraction that light even at the same time as the refractive Sikkim optically negative power in the ( IP) causes light in the X axis direction (long axis), so that a wider angle of view of the ratio between the length of the major axis length and Y-axis direction (the minor axis) of up to change. 제3렌즈(L3)는 비점수차를 보정하는 기능을 가지며, 제4렌즈(L4)는 정의 광학적 파워를 갖추며, 제5 렌즈(L5)는 음의 광학적 파워를 갖추며, 제6렌즈(L6)는 제2렌즈(L2)에서 발생되는 비회전 대칭적인 수차성분을 보정하는 기능을 한다. The third lens (L3) has a function to correct aberrations, and the fourth lens (L4) is gatchumyeo a defined optical power, a fifth lens (L5) is gatchumyeo the optical power of the well, a sixth lens (L6) is a second function for correcting the non-rotation symmetrical aberration component generated by the lens (L2). 이와 같은 전체적인 구성 하에서 다음의 조건식 1 내지 5의 작용효과에 대해 살펴본다. Under such configuration, the whole looks at the effects of the following conditional expressions 1 to 5. 여기서, FOVX 는 장축화각(수직화각)이고, FOVY 는 단축화각(수평화각)이다. Here, FOVX is a longitudinal field of view (vertical angle of view), FOVY is reduced field angle (horizontal angle). 상기 조건식 1은 수직화각과 수평화각간의 비율에 대한 것으로, 하한값을 벗어나면 상면에 불필요한 수직이미지가 나타나게 되고, 상한값을 벗어나면 비회전대칭 렌즈를 추가하여 사용하게 되어 비용이 상승된다. The condition 1 is that for the ratio between the vertical field and horizontal field of view, and appear unnecessary vertical image on the top surface is outside the lower limit, the upper limit value are confined to use by adding a non-rotationally symmetrical lens cost is raised. 여기서, EFY 는 단축(수직)유효초점거리이고, EFX 는 장축(수평)유효초점거리이다. Here, EFY is shorter (vertically) the effective focal length, EFX is the major axis (horizontal) is the effective focal length. 상기 조건식 2는 수직화각과 수평화각간의 비율에 대한 것으로, 하한값을 벗어나면 상면에 불필요한 수직이미지가 나타나게 되고, 상한값을 벗어나면 비회전대칭 렌즈를 추가하여 사용하게 되어 비용이 상승된다. The condition 2 is that for the ratio between the vertical field and horizontal field of view, and appear unnecessary vertical image on the top surface is outside the lower limit, the upper limit value are confined to use by adding a non-rotationally symmetrical lens cost is raised. 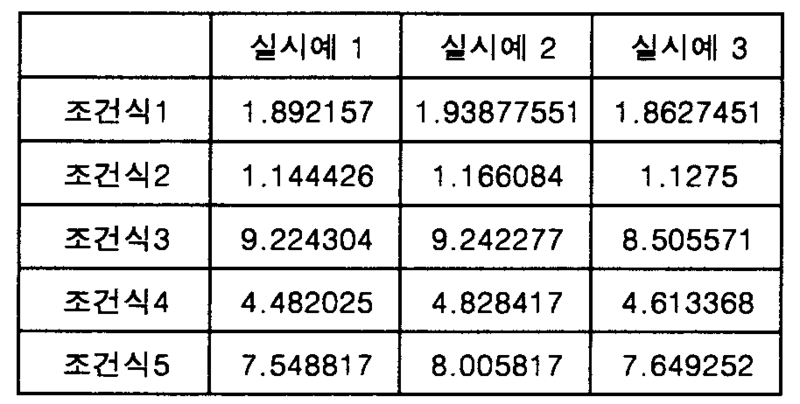 여기서, r1 은 제1렌즈(L1)의 물체측 면(1)의 곡률반경이다. Here, r1 is the radius of curvature of the object-side surface (1) of the first lens (L1). 상기 조건식 3은 수차보정에 관한 것으로, 하한값을 벗어나면 제1렌즈의 제작이 용이하지 않아 구면수차의 보정이 어려워지고, 상한값을 벗어나면 얻고자 하는 광학각을 구현하는데 어려움이 있게 된다. The third condition relates to aberration correction, is outside the lower limit value does not facilitate the making of the first lens becomes difficult to correct the spherical aberration, so that it is difficult to implement an optical character of each side beyond the upper limit gain. 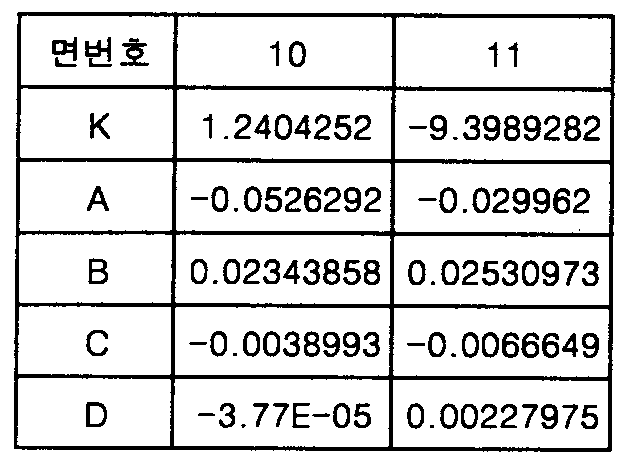 여기서, L 는 제1렌즈(L1)의 물체측 면(1)의 정점에서 상면(IP)까지의 거리 이고, 2w 는 장축화각(radian)이다. Here, L is the distance from the first lens (L1), the object-side surface (1) upper surface (IP) at the height of the, 2w is the major axis angle (radian). 상기 조건식 4는 광각 및 소형화에 관한 것으로, 하한값을 벗어나면 광학계의 전체길이가 작아져서 광학적 특성이 저하되고, 상한값을 벗어나면 광학계 길이가 길어진다. The condition 4 is directed to the wide-angle and miniaturized, beyond the lower limit value as the total length of the optical system is reduced in optical properties is reduced, beyond the upper side is an optical system length is lengthened. 여기서, Fno 는 광학계의 F-넘버이다. Here, Fno is the F- number of the optical system. 상기 조건식 5는 광학계의 밝기 및 소형화에 관한 것으로, 하한값을 벗어나면 광학계의 밝기가 상대적으로 어두워져 저조도 광원에 불리하며, 상한값을 벗어나면 광학계의 전체길이가 길어지게 된다. The condition equation 5 relates to the brightness and size reduction of the optical system, is outside the lower limit value, and the brightness of the optical system becomes relatively dark disadvantageous in low-illuminance light source, and becomes outside the upper limit, the overall length of the optical system longer side. 이하, 구체적인 실시예를 통하여 본 발명에 대하여 보다 상세히 살펴본다. Or less, more looks at in detail with respect to the present invention through specific embodiments. 이하의 제1 실시예 내지 제3 실시예는 모두 전술한 바와 같이, 물체측 면(1)이 물체측으로 볼록하고, 상측 면(2)이 상측으로 오목한 형상을 갖추어 부의 굴절력을 갖는 제1렌즈(L1)와, 양측 렌즈면(3,4)이 비회전대칭 렌즈면으로 구비되고 부의 굴절력을 갖는 제2렌즈(L2)및 물체측 면(5)이 물체측으로 볼록한 형상을 갖추어 정의 굴절력을 갖는 제3렌즈를 포함하여 전체적으로 부의 굴절력을 갖는 제1렌즈군(LG1)과, 물체측 면(8)이 물체측으로 볼록하고 상측 면(9)이 상측으로 볼록한 형상을 갖추어 정의 굴절력을 갖는 제4렌즈(L4)와, 양측 렌즈면(10,11)이 비구면으로 이루어져 부의 굴절력을 갖는 제5렌즈(L5) 및 양측 렌즈면(12,13)이 비회전대칭렌 즈면으로 구비되어 정의 굴절력을 갖는 제6렌즈(L3)를 포함하여 전체적으로 정의 굴절력을 갖는 제2렌즈(LG2)을 포함포함 A first lens having a first embodiment to power the third embodiment, as both described above, the object-side surface (1) is convex on the object side, and equipped with the image-side surface (2) concave shape in the upper portion of less than ( L1) and, having a second lens (L2), and the object-side surface (5) defined and equipped with a convex shape toward the object side lens refractive power on both sides (3, 4) is provided with a non-rotationally symmetrical lens surface having a negative refractive power the 3 and the fourth lens having a first lens group (LG1) and the object-side surface (8) defines the refractive power of the convex toward the object side and equipped with an upper surface 9 convex shape to the image side has a positive refractive power as a whole unit, including a lens ( L4), and both side lens surface (10, 11) of claim 6 having a positive refractive power, this fifth lens (L5) and both lens surfaces (12, 13) having a negative refractive power composed of an aspherical surface is provided in a non-rotationally symmetric alkylene jeumyeon lens comprises a second lens (LG2) having a positive refractive power as a whole, including the (L3) 한다. do. 그리고, 상기 제1렌즈군(LG1)과 제2렌즈군(LG2)사이에는 광량을 조절하고 불필요한 광을 차단하는 개구 조리개(S)를 포함하며, 상기 제6렌즈(L6)에서 입사된 광을 감지하며 상면(IP)에 대응하는 이미지 센서를 포함하여 구성된다. And, the light incident on the first lens group (LG1) and the second lens group (LG2) between there comprises an aperture diaphragm (S) to control the amount of light and to block the unwanted light, the sixth lens element (L6) detection and is configured to include an image sensor corresponding to the upper surface (IP). 또한, 상기 제6 렌즈(L6)와 상면(IP) 사이에는 적외선 필터, 커버 글래스 등으로 이루어지는 광학적 필터(OF)가 구비된다. Further, between the sixth lens (L6) and the top (IP) it is provided with an optical filter (OF) consisting of an infrared filter, a cover glass or the like. 이하의 각 실시예에서 제2렌즈(L2), 제6렌즈(L6)는 플라스틱 재질을 소재로 제조된다. A second lens (L2), a sixth lens (L6) in each of the following embodiments are made of a plastic material. 이하의 각 실시예에서 사용되는 비회전대칭 렌즈면은 공지의 수학식 1로부터 얻어지며, 비구면은 공지의 수학식 2로부터 얻어지며, 코닉(Conic) 상수(K) 및 비구면 계수(A,B,C,D,E)에 사용되는 'E 및 이에 이어지는 숫자'는 10의 거듭제곱을 나타낸다. 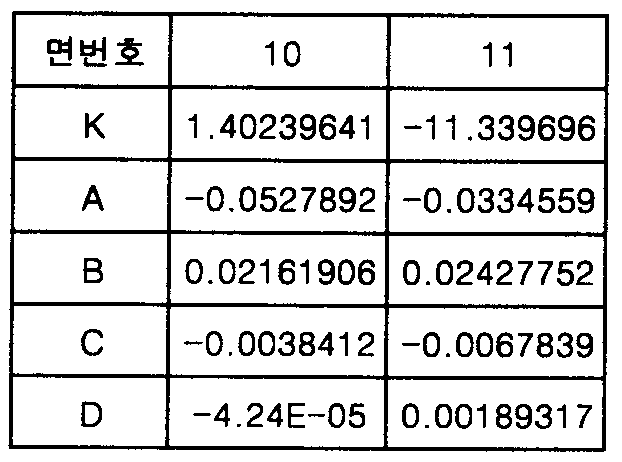 It is obtained for each embodiment in which non-rotationally symmetrical lens surface used in the examples below is from equation (1) known, an aspherical surface is obtained from the second well-known formula, conic (Conic) constant (K) and aspherical surface coefficients (A, B, C, D, E) represents the power of the 10 'and E the leading number' used in the. 예를 들어, E21은 10 21 을, E-02는 10 -2 을 나타낸다. For example, E21 has a 10 21, E-02 indicates the 10-2. 하기의 표 1은 본 발명의 제1 실시예에 의한 수치예를 나타내고 있다. 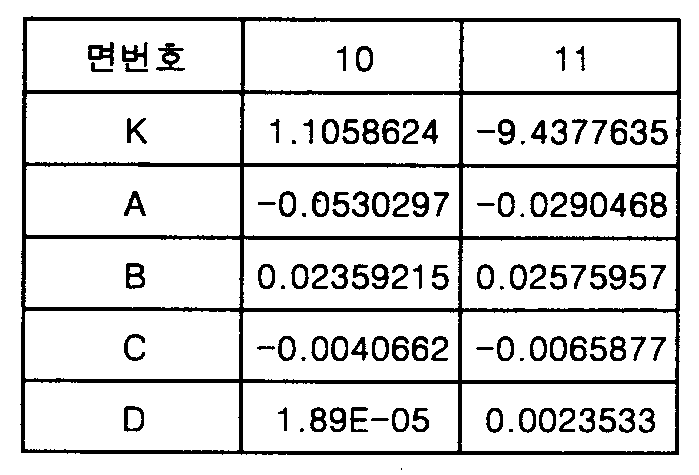 Table 1 below shows a numerical example according to the first embodiment of the present invention. 또한, 도 1은 본 발명에 의한 초광각 광학계의 제1실시예를 도시한 렌즈 구성도로서, (a)는 렌즈면의 정점을 원점이라 하고 광축방향을 Z축으로 하는 3차 기초 좌표계(X,Y,Z)에서 Z축을 통과하는 XZ평면에서 종단한 종단면도이고, (b)는 3차 기초 좌표계에서 Z축을 통과하는 YZ평면에서 종단한 종단면도이며, 도 2는 본 발명에 의한 초광각 광학계의 제1실시예에 관련된 제 수차도이다. In addition, Figure 1 is a diagram the lens construction showing a first embodiment of the ultra-wide-angle optical system according to the present invention, (a) is a tertiary base coordinate system to the optical axis direction is referred to as a home position for the vertex of the lens surface in the Z-axis (X, Y, Z) is a longitudinal section terminating at the XZ plane passing through the Z-axis in, (b) is is a longitudinal section terminating at the YZ plane through the Z-axis from the third base coordinate system, and FIG. 2 of the ultra-wide-angle optical system according to the invention the first is the aberration related to the first embodiment. 또한, 이하의 비점수차도면에서 나타나는 "S"는 새지털(sagital), "T"는 탄 젠셜(tangential)을 나타낸다. Further, "S" shown in the astigmatism diagram under the sagittal (sagital), "T" represents a tangential (tangential). 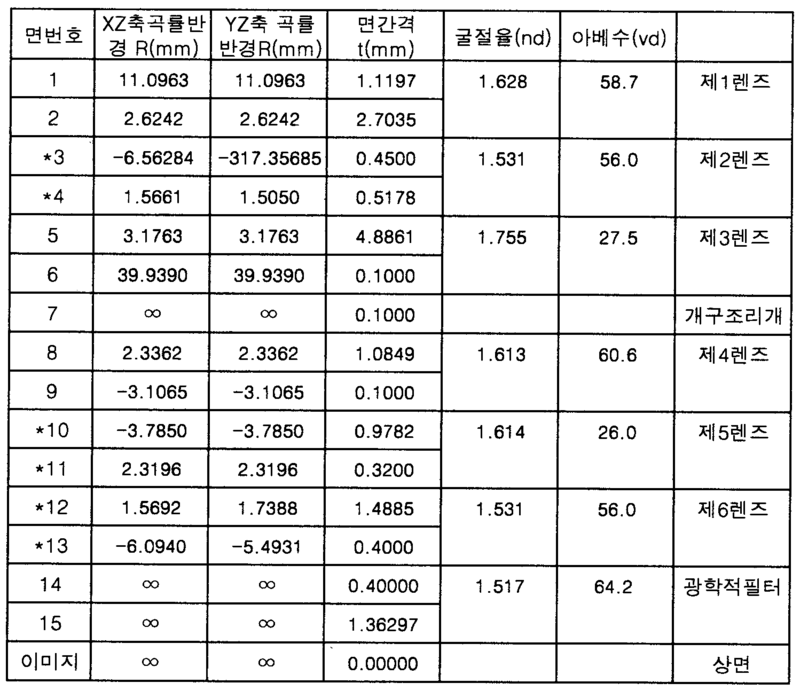 실시예 1에서 렌즈 전체계의 장축 유효초점거리(EFX)는 1.184mm이고, 렌즈 전체계의 단축유효초점거리(EFY)는 1.355mm이며, F 넘버(F No )는 2.0이고, 장축화각(FOVX)은 193도이고, 단축화각(FOVY)는 102도이며, 개구 조리개로부터 상면까지의 거리(total length)(TL)는 15.09763mm이며, 제1 렌즈(L1)의 초점거리(f1)는 -6.865924㎜, 제2 렌즈(L2)의 초점거리(f2)는 -2.234369㎜, 제3 렌즈(L3)의 초점거리(f3)는 4.302594㎜이며, 제4렌즈(L4)의 초점거리(f4)는 2.311528㎜, 제5 렌즈(L5)의 초점거리(f5)는 -2.1713139㎜, 제6 렌즈(L6)의 초점거리(f6)는 2.655767㎜이다. Example 1, the long axis effective focal length (EFX) of the entire lens system in the 1.184mm, and a shorter effective focal length (EFY) of the entire lens system is 1.355mm, F number (F No) is 2.0, and the major axis angle (FOVX ) is a 193 degree, and angle speed (FOVY) is 102 degree, and the distance to the top surface from the aperture stop (total length) (TL) is 15.09763mm, a first focal length (f1) of the lens (L1) is -6.865924 ㎜, a second focal length (f2) is -2.234369㎜, the focal length (f3) of the third lens (L3) of the lens (L2) is 4.302594㎜, the focal length (f4) of the fourth lens (L4) is 2.311528 ㎜, the focal length of the fifth lens (L5) (f5) is -2.1713139㎜, the focal length of the sixth lens (L6) (f6) is 2.655767㎜. 표 1에서 *는 비구면을 나타내며, 식 1에 의한 코닉 상수 (KX,KY) 및 비회전대칭 비구면 계수(AR,BR,CR,DR,AP,BP,CP,DP)의 값은 다음의 표2와 같으며, 식 2에 의한 코닉 상수(K) 및 비구면 계수(A,B,C,D)의 값은 다음의 표 3과 같다. In Table 1, * is the value of a denotes an aspheric surface, the conic constant (KX, KY) and non-rotationally symmetric aspherical surface coefficient (AR, BR, CR, DR, AP, BP, CP, DP) according to the formula 1 is the following Table 2 equal to the value of the conic constant (K) and aspherical surface coefficients (a, B, C, D) according to equation 2 is shown in Table 3 below. 하기의 표 4은 본 발명의 제2실시예에 의한 수치예를 나타내고 있다. 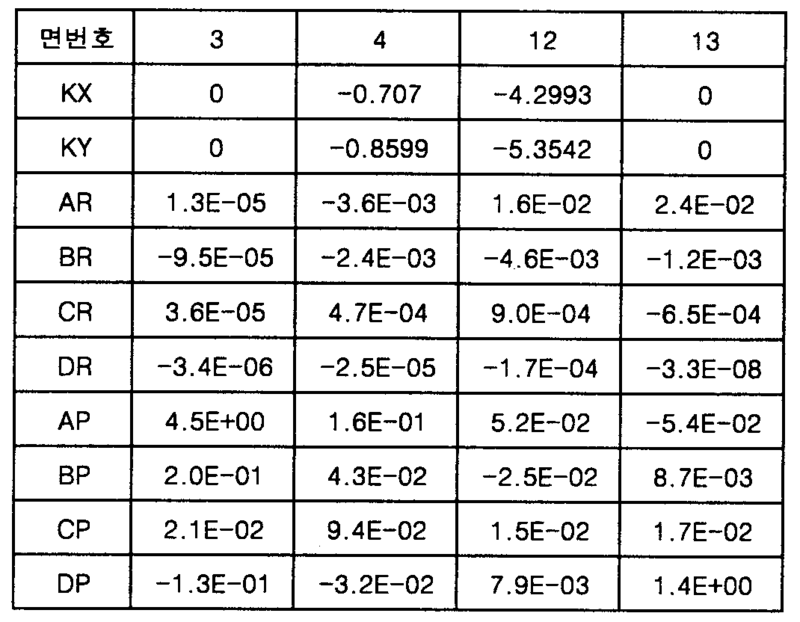 Table 4 shows a numerical example according to the second embodiment of the present invention of. 또한, 도 3은 본 발명에 의한 초광각 광학계의 제2실시예를 도시한 렌즈 구성도로서, (a)는 렌즈면의 정점을 원점이라 하고 광축방향을 Z축으로 하는 3차 기초 좌표계(X,Y,Z)에서 Z축을 통과하는 XZ평면에서 종단한 종단면도이고, (b)는 3차 기초 좌표계에서 Z축을 통과하는 YZ평면에서 종단한 종단면도이며, 도 4는 본 발명에 의한 초광각 광학계의 제2실시예에 관련된 제 수차도이다. In addition, FIG 3 is a second lens construction showing a second embodiment of the ultra-wide-angle optical system according to the present invention, (a) is a tertiary base coordinate system to the optical axis direction is referred to as a home position for the vertex of the lens surface in the Z-axis (X, Y, Z) is a longitudinal section terminating at the XZ plane passing through the Z-axis in, (b) is a longitudinal section terminating at the YZ plane through the Z-axis from the third base coordinate system, Figure 4 is a super wide angle optical system according to the invention the first is the aberration related to the second embodiment. 실시예 2에서 렌즈 전체계의 장축 유효초점거리(EFX)는 1.2006mm이고, 렌즈 전체계의 단축유효초점거리(EFY)는 1.40000mm이며, F 넘버(F No )는 2.0이고, 장축화각(FOVX)은 190도이고, 단축화각(FOVY)는 98도이며, 개구 조리개로부터 상면까지의 거리(total length)(TL)는 16.01163mm이며, 제1 렌즈(L1)의 초점거리(f1)는 -5.763675㎜, 제2 렌즈(L2)의 초점거리(f2)는 -2.335535㎜, 제3 렌즈(L3)의 초점거리(f3)는 4.322176㎜이며, 제4렌즈(L4)의 초점거리(f4)는 2.352415㎜, 제5 렌즈(L5)의 초점거리(f5)는 -2.233556㎜, 제6 렌즈(L6)의 초점거리(f6)는 2.519019㎜이다. Example 2 major axis effective focal length (EFX) of the entire lens system in is 1.2006mm, and a shorter effective focal length (EFY) of the entire lens system is 1.40000mm, F number (F No) is 2.0, and the major axis angle (FOVX ) is 190 degrees, and the angle speed (FOVY) is 98 degrees, and the distance (total length) (TL) to the upper surface from the aperture stop is 16.01163mm, a focal length (f1) of the first lens (L1) is -5.763675 ㎜, a second focal length (f2) is -2.335535㎜, the focal length (f3) of the third lens (L3) of the lens (L2) is 4.322176㎜, the focal length (f4) of the fourth lens (L4) is 2.352415 ㎜, the focal length of the fifth lens (L5) (f5) is -2.233556㎜, the focal length of the sixth lens (L6) (f6) is 2.519019㎜. 표 4에서 *는 비구면을 나타내며, 식 1에 의한 코닉 상수 (KX,KY) 및 비회전대칭 비구면 계수(AR,BR,CR,DR,AP,BP,CP,DP)의 값은 다음의 표5와 같으며, 식 2에 의한 코닉 상수(K) 및 비구면 계수(A,B,C,D)의 값은 다음의 표 6과 같다. In Table 4, * indicates an aspheric surface, the conic constant (KX, KY) and non-rotationally symmetric aspherical surface coefficient of the formula (1) the value of (AR, BR, CR, DR, AP, BP, CP, DP) has the following Table 5 equal to the value of the conic constant (K) and aspherical surface coefficients (a, B, C, D) according to equation 2 is shown in the following Table 6. 하기의 표 7은 본 발명의 제3실시예에 의한 수치예를 나타내고 있다. 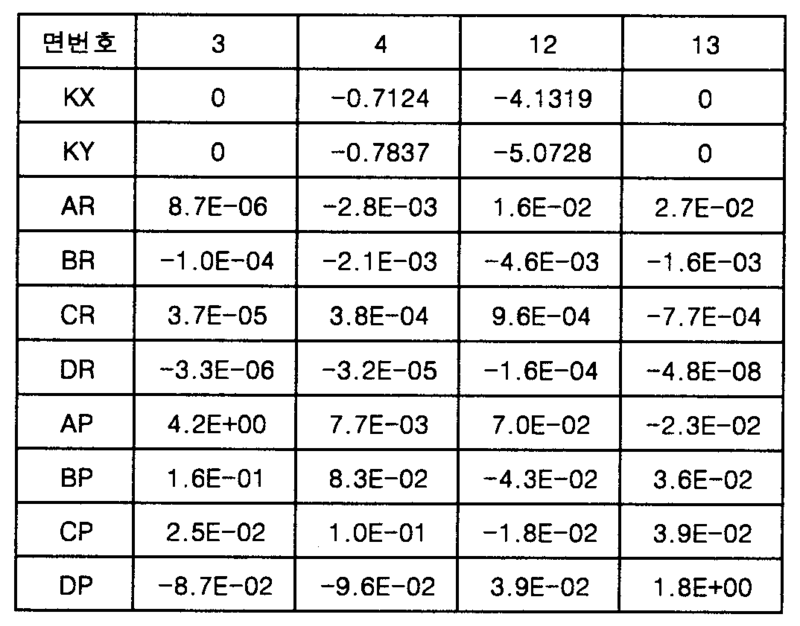 Table 7 shows the numerical examples according to the third embodiment of the present invention. 또한, 도 5는 본 발명에 의한 초광각 광학계의 제3실시예를 도시한 렌즈 구성도로서, (a)는 렌즈면의 정점을 원점이라 하고 광축방향을 Z축으로 하는 3차 기초 좌표계(X,Y,Z)에서 Z축을 통과하는 XZ평면에서 종단한 종단면도이고, (b)는 3차 기초 좌표계에서 Z축을 통과하는 YZ평면에서 종단한 종단면도이며, 도 6은 본 발명에 의한 초광각 광학계의 제3실시예에 관련된 제 수차도이다. In addition, Figure 5 is a diagram claim lens construction showing a third embodiment of the ultra-wide-angle optical system according to the present invention, (a) is a tertiary base coordinate system to the optical axis direction is referred to as a home position for the vertex of the lens surface in the Z-axis (X, Y, Z) is a longitudinal section terminating at the XZ plane passing through the Z-axis in, (b) is a longitudinal section terminating at the YZ plane through the Z-axis from the third base coordinate system, Figure 6 is a super wide angle optical system according to the invention the first is the aberration related to the third embodiment. 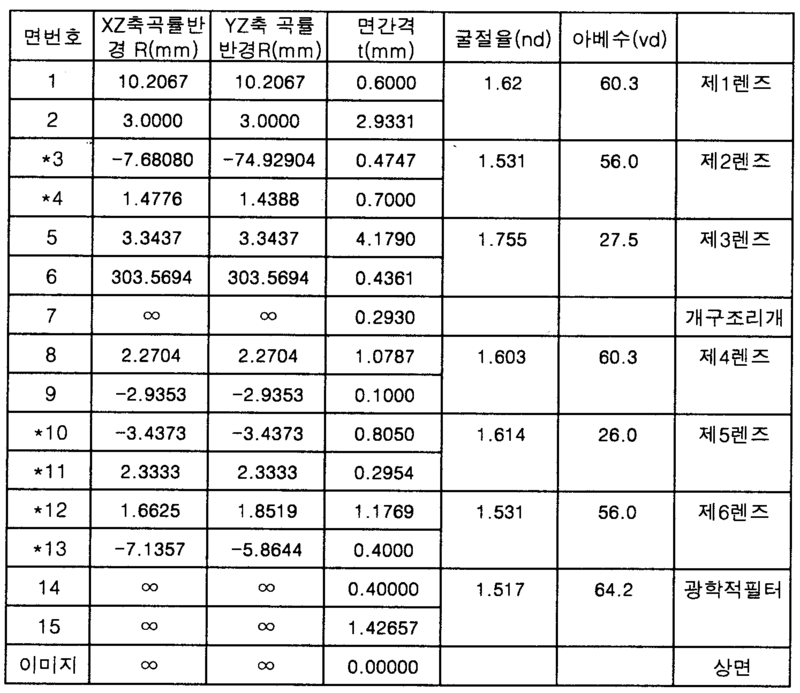 실시예 3에서 렌즈 전체계의 장축 유효초점거리(EFX)는 1.2mm이고, 렌즈 전체계의 단축유효초점거리(EFY)는 1.35300mm이며, F 넘버(F No )는 2.0이고, 장축화각(FOVX)은 190도이고, 단축화각(FOVY)는 102도이며, 개구 조리개로부터 상면까지의 거리(total length)(TL)는 15.29850mm이며, 제1 렌즈(L1)의 초점거리(f1)는 -7.073965㎜, 제2 렌즈(L2)의 초점거리(f2)는 -2.291838㎜, 제3 렌즈(L3)의 초점거리(f3)는 4.450255㎜이며, 제4 렌즈(L4)의 초점거리(f4)는 2.302125㎜, 제5 렌즈(L5)의 초점거리(f5)는 -2.17453㎜, 제6 렌즈(L6)의 초점거리(f6)는 2.662062mm이다. 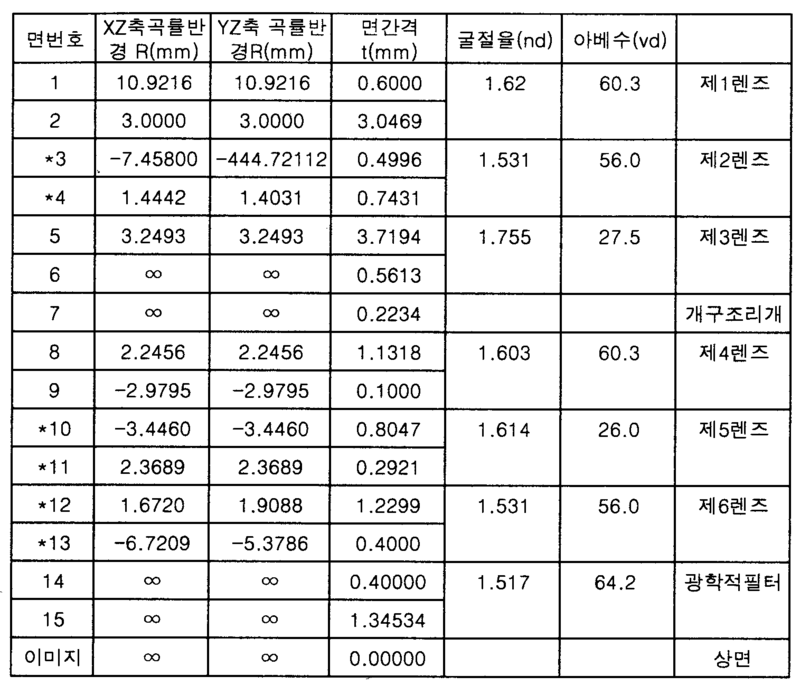 Example longitudinal effective focal length (EFX) of the entire lens system at 3 is 1.2mm, and the shorter the effective focal length (EFY) of the entire lens system is 1.35300mm, F number (F No) is 2.0, and the major axis angle (FOVX ) is 190 degrees, and the angle speed (FOVY) is 102 degree, and the distance to the top surface from the aperture stop (total length) (TL) is 15.29850mm, a first focal length (f1) of the lens (L1) is -7.073965 ㎜, a second focal length (f2) is -2.291838㎜, the focal length (f3) of the third lens (L3) of the lens (L2) is 4.450255㎜, the focal length (f4) of the fourth lens (L4) is 2.302125 ㎜, the focal length of the fifth lens (L5) (f5) is -2.17453㎜, the focal length of the sixth lens (L6) (f6) is 2.662062mm. 표 7에서 *는 비구면을 나타내며, 식 1에 의한 코닉 상수 (KX,KY) 및 비회전대칭 비구면 계수(AR,BR,CR,DR,AP,BP,CP,DP)의 값은 다음의 표 8과 같으며, 식 2에 의한 코닉 상수(K) 및 비구면 계수(A,B,C,D)의 값은 다음의 표 9와 같다. In Table 7, * denotes an aspherical surface, the value of the conic constant (KX, KY) and non-rotationally symmetric aspherical surface coefficient (AR, BR, CR, DR, AP, BP, CP, DP) according to the equation 1 is indicated in Table 8 the same as the value of the conic constant (K) and aspherical surface coefficients (a, B, C, D) according to equation 2 are shown in the Table 9. 상기의 실시예 1 내지 3에 대한 조건식 1 내지 5의 값은 다음의 표 10과 같다. Value of the condition 1 to 5 for the above-mentioned Examples 1 to 3 are shown in the following Table 10. 상기의 표 10에서와 같이 본 발명의 실시예 1 내지 3은 조건식 1 내지 5를 만족하고 있으며, 도 2, 도 4, 도 6에 도시된 바와 같이 제 수차의 특성이 우수한 렌즈 시스템을 구현함을 확인할 수 있다. 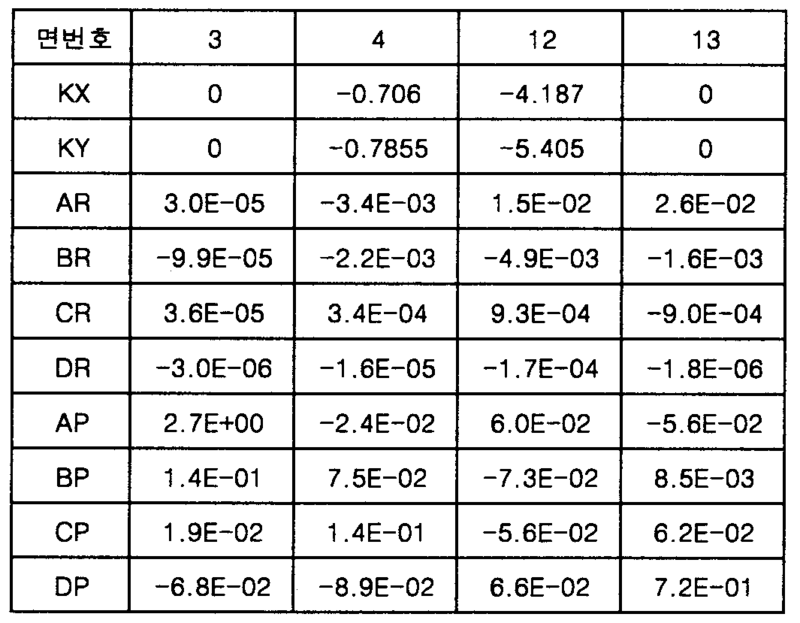 That the first to the third embodiments is the condition 1 to 5 are satisfied, 2, 4, the characteristics of the aberration implement excellent lens system as shown in Figure 6 of the present invention as shown in the Table 10 It can be found. (b)는 3차 기초 좌표계에서 Z축을 통과하는 YZ평면에서 종단한 종단면도이다. (B) is a longitudinal sectional view of a profile in the YZ plane through the Z-axis in the third coordinate system based. 도 2는 본 발명에 의한 초광각 광학계의 제1실시예에 관련된 제 수차도이다. 2 is an aberration diagram relating to the first embodiment of the ultra-wide-angle optical system according to the present invention. 도 4는 본 발명에 의한 초광각 광학계의 제2실시예에 관련된 제 수차도이다. 4 is an aberration diagram relating to the second embodiment of the ultra-wide-angle optical system according to the present invention. (b)는 3차 기초 좌표계에서 Z축을 통과하는 YZ평면에서 종단한 종단면도이 다. (B) is a longitudinal sectional view of a profile in Doi YZ plane through the Z-axis in the third coordinate system based. 도 6은 본 발명에 의한 초광각 광학계의 제3실시예에 관련된 제 수차도이다. Figure 6 is the aberration related to the third embodiment of the ultra-wide-angle optical system according to the present invention. 다음의 조건식 1을 만족함을 특징으로 하는 초광각 광학계. Ultra-wide-angle optical system for the following conditional expression 1 characterized satisfied. 상기 제2렌즈군은 물체측 면이 물체측으로 볼록하고 상측 면이 상측으로 볼록한 형상을 갖추어 정의 굴절력을 갖는 제4렌즈와, 물체측 면이 상측으로 오목하고 상측 면이 물체측으로 오목한 형상을 갖추어 부의 굴절력을 갖는 제5렌즈 및 물체측 면과 상측 면이 비회전대칭렌즈면으로 구비되어 정의 굴절력을 갖는 제6렌즈를 포함함을 특징으로 하는 초광각 광학계. The second lens group is an object side and the fourth lens surface convex toward the object and the image-side surface equipped with a convex shape toward the image side has a positive refractive power, the object side surface is equipped with a concave shape in a side recess in the upper side and the image side toward the object side portion the fifth ultra-wide-angle optical system, characterized in that a lens surface and an object side surface and the upper side comprises a sixth lens having a positive refractive power is provided in a non-rotationally symmetrical lens surface having a negative refractive power. 제2항에 있어서, 상기 제1,2렌즈군의 렌즈들중 적어도 2개이상이 렌즈가 적 어도 한면이 비구면인 플라스틱 소재로 이루어짐을 특징으로 하는 초광각 광학계. The method of claim 2 wherein the ultra-wide-angle optical system, characterized in that said second at least two of the lenses of the second lens group is a lens ever one surface is made of an aspherical surface of plastic materials even. 제1항 또는 제2항에 있어서, 상기 제1렌즈군과 제2렌즈군은 상면에서의 장축화각이 130도이상으로 구비됨을 특징으로 하는 초광각 광학계. According to claim 1 or 2, wherein the first lens group and the second lens unit is ultra-wide-angle optical system, it characterized in that the major axis angle of the upper surface having a 130 degrees or more. 제1항 또는 제2항에 있어서, 다음의 조건식 2를 만족함을 특징으로 하는 초광각 광학계. The method of claim 1 or 2, wherein the ultra-wide-angle optical system according to claim satisfies the following conditional expression 2. 제1항 또는 제2항에 있어서, 다음의 조건식 3을 만족함을 특징으로 하는 초광각 광학계. The method of claim 1 or 2, wherein the ultra-wide-angle optical system according to claim 3, satisfies the following conditional expression. 다음의 조건식 4을 만족함을 특징으로 하는 초광각 광학계. Ultra-wide-angle optical system for the following condition 4, characterized satisfied. 다음의 조건식 5을 만족함을 특징으로 하는 초광각 광학계. Ultra-wide-angle optical system for the following condition 5, characterized satisfied.